Therefore, as the brilliant beings we are, we learned to disguise our demands to sound like requests. You don’t think you make demands? Think again. 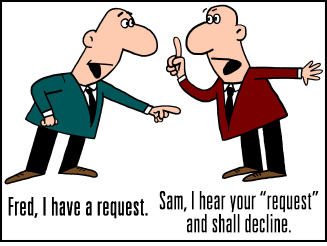 The litmus test for a request is that the other person has the right to say “No” without any negative repercussions coming their way. That means you cannot argue with them, pout, yell, scream, cry, or negotiate.